VW should buy all their diesel equipped cars here in the US and “redeploy” them to markets where pollution rules are less stringent. 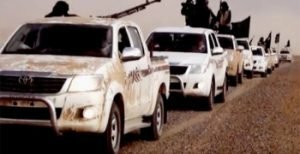 Toyota’s days of dominance in the ISIS market may soon be over. Next? The J.C. Whitney catalogue offering after market roof racks reinforced to handle rocket launchers! Damn, war opens some wonderful business opportunities. Ya mean ..like these Japanese cars? Haha. Perfect. Eventually, all American cars will be leased autonomous non driver cars. We’ll have a backlog of “normal” cars to sell to Cuba/So. America for generations to come. Thank god I’m not going to be around to see that day though. The thoughts of freeways and roads filled with robotic car makes me sick. Even if they do save lives. One of my favorite things to do when I was younger was driving little ole backroads and towns through the Sierra’s in California, Oregon and Washington. But those days will be over within a decade. Too bad. Ah..but progress. Like AI. Orwell would faint. Fun fact: my old car probably went to North Korea. When I was at the US embassy in Tokyo, we had a bunch of pass along cars. Nobody stayed in country for more than a few years, and our diplomatic vehicles were exempted from Japan’s tough inspection rules. So, a lot of near-junkers got passed down from one’s predecessor to you for a few bucks. The one I had finally reached the end of its lifespan, and the only way to get rid of it was to sell it to a dealer in such things. I asked if he was going to junk it for scrap value, and he said “Oh no, I can make more sending it to North Korea. They’ll either use it, or use it for parts.” Of course, he must have been kidding, right? ISiS thinks American cars come with tracking devices . HaHa those stupid ISIS people.. Such paranoids. Peter- you probably feel horrible knowing that the battery and cigarette lighter circuit from your old junker are now probably being used by NK interrogators to elicit confessions from brave dissidents. But what the hell- how could you have known? The dealer had to jump start my car to drive it away, so I think the battery was pretty much shot, and my conscience is OK.
Israel KNOW$ A DEAL ! I just figured the media were recycling the same photo and video, as needed. There’s one thing I can honestly say about Toyota’s. At least the older ones. They run FOREVER…given you maintain them. Case in point. My father-in-law, bought a brand new 1986 Toyota S-1 pickup with a SR-2 engine. Greatest truck since the Model T pickup and the best engine ever built. He drove it until he was too old to drive anymore, in 2002. He gave it to me. It had 150k miles on it. I drove it until May 2013, when it blew a timing chain. I sold it and STILL got a whopping $1k for it, as those S-1’s are in high demand. I used the money to buy a 1982 Toyota Station wagon, from a guy who bought it new. Perfect condition. Reason…he was the local Toyota dealer head mechanic. Maintenance by the book. I still own and drive it daily. The only bad thing is…I towed it to Michigan when I moved. Within 3 years, the body is now a rust bucket. fuk. But runs like a champ. So..I’m pulling the engine and selling it. This is a 3T-c which Toyota actually designed as a race engine. They’re going for close to $2k now. So..all in all.. I’ve driven these cars for almost free, for over 10 yrs. I just wish I could find another S-1 pickup. Ain’t gonna happen though. NO one sells them. They drive them till they die. No wonder ISIS chose Toyota. Heeeyyy, if we ever capture any intact, see if the local dealer has a clean chain of custody. This one of the many things needs to be addressed. Peter, we know now US and Russia and Iraqi Army all fighting ISIL in Iraq and Al-sham. All photos show their fighters with Afghani/Pakistani dress in black, all faces were faceless, I mean, if they are fighting for God (as in Jihad), then they have nothing to be afraid of. I’ve never seen fighters of God be afraid of being recognized throughout history. They should be proud of what they do. Few shown their ugly face for example Al-Baghdadi himself does not cover his face, neither did the senior leader and spokesman Abu Mohammad al-Adnani. When reported there were killed a group of Isil in attacked of with whatever army we seen bodys lying on the ground with faces down with military dress is!! So were the truth here, is it those black flag and Afghani/Pakistani dress for military with 4WD Toyota is it military show or at battlefield? There is another aspect of ISIL which using Orang/ Blue execution dress for their captives, just like those in western prisoner and criminal dress, we know these “Islamic” radicals who forbid using “western” tool or dressing like them as their believes why then using western execution dress? Btw, how many westerner who fought with ISIL and that Journalist who were in Syria undercover telling what life under ISIL, all did not telling us about these things? Did they use Samrt phone? I dout not, what about the internet? Did you hear the latest that ISIS Targeting Children? Launches App for Kids to Learn Arabic using Tank and other bit teach Arabic?